Well, after two years, the dog has gone through the normal wear and tear (plus a little more), and we’re not sure how much longer dog will last. We need to find him a new one, because he loves it so much and can’t even sleep without it. Ana is looking for this dog, too. But Toys R Us no longer sells it, and I don’t know where to find it. I bought it in Nov or Dec of 2006. 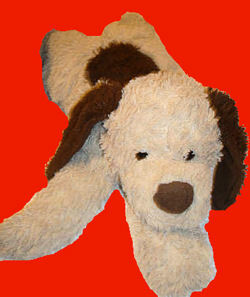 It’s a light tan large size dog, with dark brown flappy ears and a round dark spot on its back. If anyone can help we’ll be so thankful! !